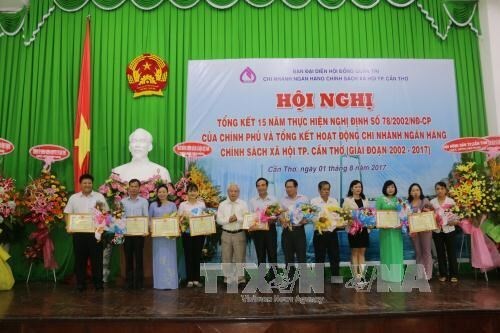 Can Tho (VNA) – Credits provided by the Vietnam Bank for Social Policies have helped 179,100 households in the Mekong Delta city of Can Tho escape from poor and near-poor status over the past 15 years, heard a conference in the city on August 1. According to the Can Tho branch of the Vietnam Bank for Social Policies, it has launched additional 11 new credit programmes, raising the total ongoing credit programmes in the city to 14, with loans totalling 5,067 billion VND (222.95 million USD), benefiting 498,684 people. The programmes have also helped create jobs for 270,800 labourers, provide financial assistance for nearly 45,000 students with difficult backgrounds, and build clean water stations and toilets for over 69,200 households. These programmes have also assisted the building of 2,200 flood shelters for local residents, over 2,900 houses for the poor households, and provided preferential loans for 14,070 households. Speaking at the event, Deputy Director General of the bank Vo Minh Hiep urged local authorities and the provincial Vietnam Bank for Social Policies branch to strengthen communication work to raise the awareness among locals on the preferential credit programmes while allocating resources for assisting locals and building new style rural areas.